Chalazion (chalazia for plural) means ‘small lump’ in Greek. Chalazia are painless benign lumps that grow on the eyelid. 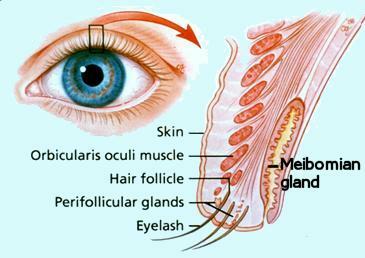 There are 20 to 40 oil glands (also called meibomian glands) in each of the upper and lower eyelids. These oil glands secrete an oily substance that mixed with our tear films to lubricate and prevent drying of the eyes. Sometimes, one or more of these meibomian glands get clogged. This blockage eventually gets bigger and become a visible lump called chalazion. That is why chalazia are also known as meibomian cysts. Chalazia are harmless and many of them drain out on their own especially if warm compress is used to facilitate healing. However, some may stay infinitely and others may keep growing in size. Eventually, a large meibomian cysts may deform the cornea and causes astigmatism. If you are exhibiting the following symptoms, you may be having meibomian cysts. Chalazia are often mistaken with eye styes. A eye stye (hordeolum) is an acute infection of the oil gland. 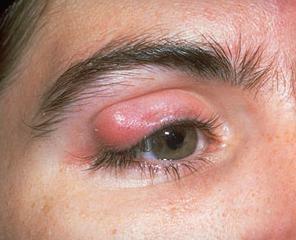 It often manifests itself as a red, swollen and painless bump on the eyelid. There is usually a white or yellow spot in the middle of an eye stye. On the other hand, a meibomian cysts is a result of blockage in one or more oil glands. It is not an infection but is an inflammation of the area. Chalazia are usually painless, larger than eye styes and are often located away from the edges of the eyelid. You can also differentiate them by giving a gentle push on the skin of the eyelid near the bump. If the bump moves with skin, it is likely an eye stye. If the skin moves but the bump doesn’t, you probably have a meibomian cysts. The oil that is produced by the meibomian glands exits from each gland through a drainage system. Which is located just behind the eyelashes of the upper and lower lids. When the oil becomes too thick or the narrow opening of meibomian glands becomes blocked. As the oil cannot escape, it stores up inside the gland and forms a lump in the eyelid. Eventually the gland may break open, leaking oil into the surrounding tissue causing an inflammation of the eyelid. And thus meibomian cysts occurs. Meibomian cysts can also develop if an internal hordeolum isn’t drained and healed. Who Is At Higher Risks Of Getting Chalazia? Have systemic diseases, such as diabetes. Consistently don't remove eye makeup completely or sleep with eye makeup on. Don’t ‘pop’ or scratch a chalazion as the lump may have infectious agents living within. Once they get out, they may infect the surrounding healthy tissue and spread the infection further. Chalazia are usually painless and many resolve on their own within a month without treatment. However, some chalazia do not resolve themselves and may stay indefinitely. Therefore here are some treatments to speed up the healing process. For more information, see Treatments For Chalazion.